This estate 1950s diamond platinum wedding ring has a special date inscription. This ring features seven bright, fiery white diamonds. At the heart of this ring is the largest diamond, while other diamonds gradually descend in size. Each of the seven diamonds are individually square framed. 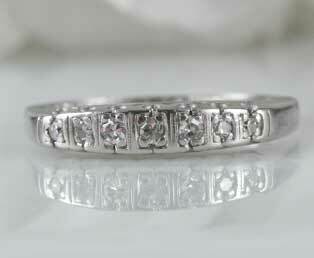 This lovely platinum wedding band has a date inscription of 1/14/1950 and an initial inscription.